April 16, 2013 - As if he was a field commander rallying his troops, "the dean of Florida historians" was distributing ammunition among those who fight to correct American history, especially those who try to dispel the misconceptions about the Spanish explorers who discovered a land they called "La Florida" in 1513. While others were preparing picket signs that would accuse the conquistadors of genocide, Dr. Michael Gannon was opening the April 2 celebrations to commemorate the 500th anniversary Juan Ponce de Leon's discovery of North America. 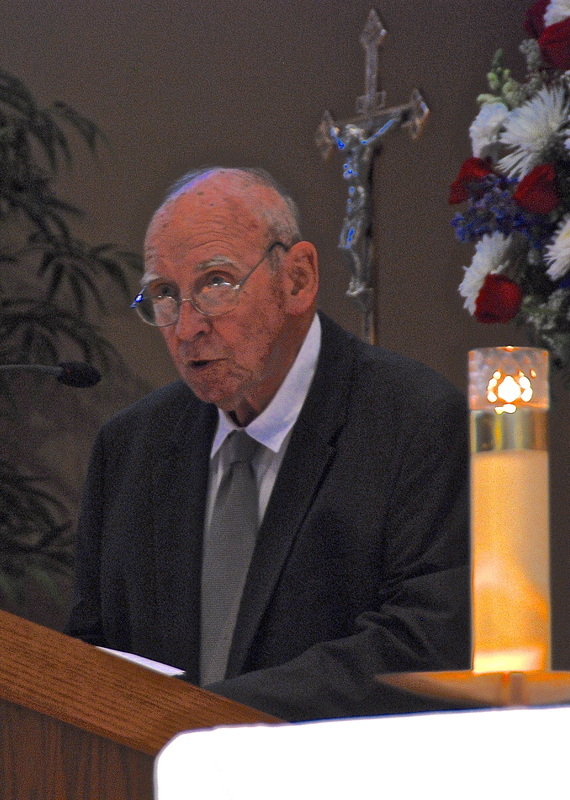 "We are all honored to be alive on an anniversary of this magnitude," Gannon told a crowd of history buffs who had filled the Immaculate Conception Catholic Church in Melbourne Beach, Fla.
Of course, he was literately preaching to the choir. In the audience, there were people who take their history so seriously that they were dressed as Spanish conquistadors, people who have spent years on a crusade to get Ponce de Leon and his men the recognition they deserve. 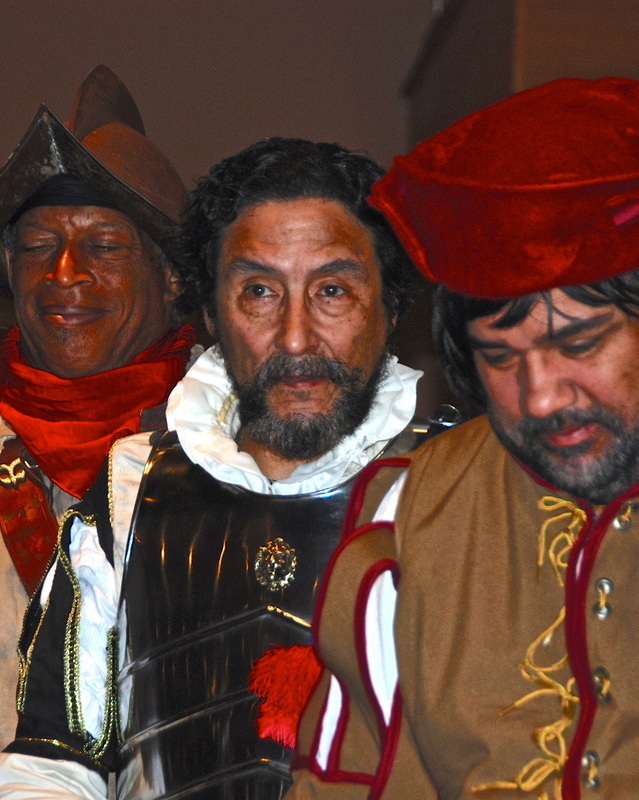 Led by Samuel Lopez, a New York Puerto Rican who relocated in Melbourne, these 21st century crusaders — "the Royal Order of Juan Ponce de Leon" - still are valiantly combatting that anti-Hispanic "Black Legend" propaganda that began in the 16th century. And on the morning of April 2, it was as if they were getting a pep talk from the ultimate authority on Florida's Spanish history — the Distinguished Service Professor of History at the University of Florida. 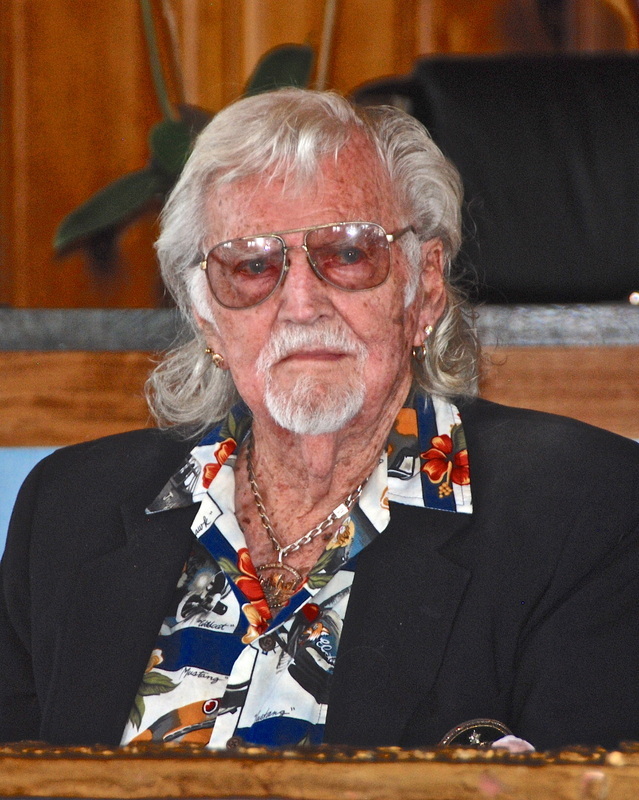 As if he was anticipating the ignorance that would be displayed by a handful of protesters who picketed another celebration event later that day, Gannon spoke of the myths and misconceptions about Ponce de Leon. He explained that there is no clear evidence that Ponce de Leon was searching for the mythical Fountain of Youth, that historical records show he "did not wish to do the natives harm," and that he had noble intentions of establishing Spanish settlements and bringing Christianity to North America. He explained that it was Ponce de Leon and his men who were under constant attacks from the Florida natives, that Ponce de Leon "was forced to fight in order to save his men's lives and their boats, oars and weapons," and that upon returning to Florida eight years after his 1513 voyage, Ponce de Leon was driven back into the sea and mortally wounded by the Calusa natives. Of course, in the audience, listening to such vindicating words from such an authority made people like John Ayés burst with pride. After all, Ayés, 67, has traced his genealogical roots and Gannon was talking about his multiple-great-granddaddy. "It's just a wonderful day," Ayés whispered when I asked him to share his sentiments. But he didn't have to say much. He was wearing an impressive Spanish armor that illustrated his "huge pride." Even before protesters could begin to promote the Black Legend, with picket signs demonizing the Spanish explorers, Gannon had made it clear that the violence came from the natives. "No cause for the natives' violence is given in the record (of Ponce de Leon's voyage). Whether it was provoked by earlier mission of slaving expeditions, or by the natives' own long tradition of intertribal warfare, or by simple fear of these strange creatures from another world." Even before protesters could question why the Spanish are credited with "discovering" a land that already was occupied by natives, Gannon was giving his troops a new Spanish Armada with which to defend our Hispanic heritage. "I would suggest that we say that Juan Ponce's voyage constituted the first known, or documented, discovery of Florida," Gannon said. All over Northeast Florida last week, those who still promote the Black Legend were grossly outnumbered by those insisted that they were indeed commemorating a great discovery. "It was the first time that the Old World European cultures met the New World indigenous folks," said Dana Ste. Claire as he opened the April 3 ceremonies in St. Augustine. "Neither one of them knew the other one was on the other side of the planet." In both Melbourne Beach and St. Augustine, many of the celebrants acknowledged that the clash of Spanish and Native American cultures had many negative consequences, especially diseases that decimated native nations. But they also recognized the many positive results of the encounter between Europe and North America. And they refuse to judge the people of the 16th century by the moral and human rights standards of the 21st century. "We are not here to celebrate the unfortunate consequences of that meeting," added Ste. Claire. "Because, yes it did, it led to the decimation of Native Americans, many sophisticated cultures and societies that lived here. But it also represented — in a moment and a day — a time when the world changed forever, when Old World and New World came together, and it's never been the same since. So we are here to commemorate this very important day in world history." Sometimes having to shout over the interventions of protesters, Ste. Claire noted, "while it is the case that some may not want to participate in our ceremony, or understand it, there are a number of things that we do want to celebrate." To hear white folks speaking this way, and many more white folks applauding, well, sometimes I thought I was dreaming. Does this only happen every 500 years? While others were mispronouncing "Viva Florida," I was happy to see them trying to put two Spanish words together. At the Cathedral Basilica of Saint Augustine, the oldest church in the country, where a special mass was celebrated a short while later, parishioners were reminded that Franciscan missionaries were the first civil rights leaders of the New World and that among Spain's unique gifts to America was Christianity. 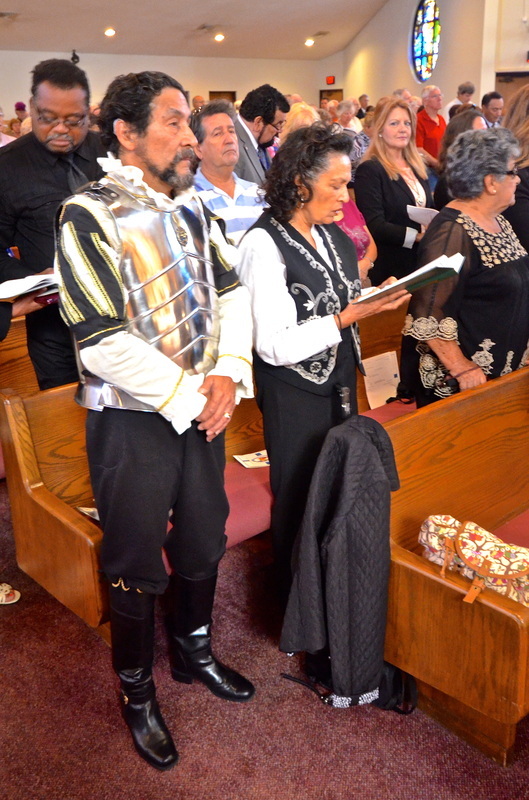 "Spain brought many gifts in the aftermath of Juan Ponce de Leon's landing in this territory," said homilist Rev. Robert J. Baker, Bishop of Birmingham. Ala. "But from the church's standpoint, its greatest gift was the faith." Everywhere I turned, America's hidden Hispanic heritage was being exposed in Florida last week. I was surrounded by people who think as I do. Sometimes it was if I was listening to myself speak, especially when I met historian and navigator Douglas T. Peck. "Ponce de Leon was the most important explorer after Columbus," Peck told me. "But you wouldn't get that from your history books. They report him as just another conquistador who was only interested in gathering slaves and finding gold. He wasn't interested in either one. He was an immensely wealthy man ... He didn't need slaves or gold, and yet that's what is taught in our schools today. It's sad." Of course for Lopez, his United Third Bridge organization and the Royal Order of Juan Ponce de Leon, getting both Gannon and Peck to speak at their April 2 events was a huge coup, especially since these two top historians now agree that Ponce de Leon landed in Melbourne Beach instead of St. Augustine. But that's fodder for yet another column, coming soon.